"A Holiday Blogging Event for Animals in Need"
Hey, have you heard about the terrific holiday event Two Little Cavaliers is running from December 14th through the 28th? 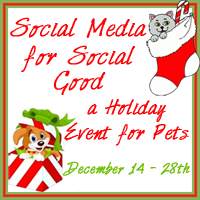 "A Holiday Blogging Event for Animals in Need" is designed to help us bloggers get a little publicity and our favorite charity a decent pile of cash! For the record, if I happen to be the one selected, I pledge 100% of the funds to Save a Sato in Puerto Rico - Bella's rescue organization. There's also a prize for the blog that sends over the most folks who sign up to participate so if you happen to hop on over and join, you can mention you saw it here at Bringing up Bella. The more folks who participate, the bigger the pot at the end of the event! So blogger or non, I hope you'll consider heading over to the Two Little Cavaliers' site to contribute to the "Chip In". Think of it as a holiday gift you'll open to you see who wins when all the other presents are gone. We`re participating too! Thanks for the reminder to blog about it!